Long ago, when Isaiah was still tiny enough to fit in my belly, I went forth to a thrift store and bought a blouse. I mostly got it because of the beautiful chunky lace in the front, and I assumed it was a maternity blouse with the band in the front. Alas, after I bought it and tried it on, I found it did not fit well. At all. And it was not really a maternity blouse at all. So I refashioned it. I cut the sleeves into cap sleeves, and turned under the edge a couple times and sewed it. I cut the neck wider, and finished it off with bias tape folded over and sewn into the inside. I took a couple inches off the bottom, about 1.5" out of each side, and cut off the too-long bust by a couple inches, raising the waist band to empire level. 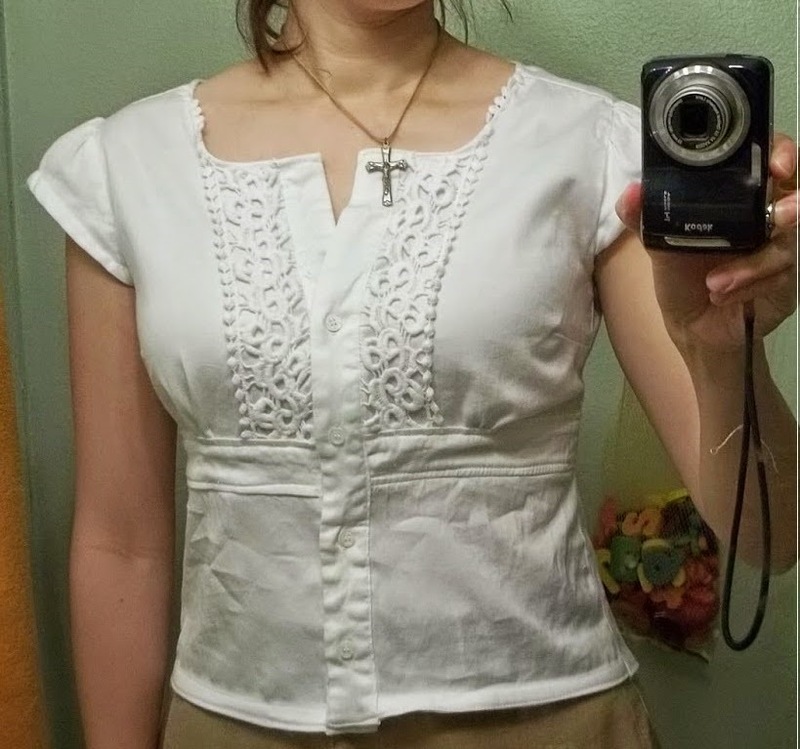 I also picked off the bottom of the blouse from the band and ironed out the gathers, cut off the 1" extra of ease that gave, and reattached the buttons and button holes (yay for the seam ripper). The gathers there really don't give much in the way of pregnancy room (only 1" extra...perhaps because I tend to carry in front??? maybe??) and I thought it looked better without them. So, now at least I have a wearable blouse. The thing I'm proudest of is how I carefully picked the button hole/button strips off the fabric, did all my shortening, and then sewed them back in, and trimmed off the excess from the bottom.